What do you think when you see those ‘L’ plates on the car in front? ‘Oh no, that’s going to slow me down...’? ; ‘Glad I got my test out of the way years ago’? There is a clear consensus that the future now emerging will be extremely different from anything we have ever known in the past….There is no prior period of change that remotely resembles what humanity is about to experience. (Gore 2013: xv). There are almost daily headlines around such issues as energy,food security, biodiversity and species loss, poverty and inequity, climate change and shifting and extreme weather patterns, employment issues, social justice, economic volatility and a rising population. These fuel a renewed urgency and debate about the possibility of sustainable development (Assadourian and Prugh 2013) – how to live well, into the future, without eroding the Earth’s ability to sustain present and future generations. Continuing the metaphor, we can ‘drive on’ blindly of course, hoping for the best. Or we can anticipate, think ahead, take avoiding action, take alternative routes. We can choose to be wise learners for the future. When I started in environmental education some 40 years ago, it was about education that would help people understand and act on environmental issues. Now, more broadly, it’s about education and learning that can help secure a more sustainable future than ‘the one in prospect’ – as the renowned educator David Orr puts it. Of course, there is a good deal of concern about what are sometimes referred to as the ‘grand challenges’ of our age. Prior to and following the Rio+20 Summit of 2012, which brought the world community together to look at issues of global sustainable development, there have been numerous high level reports and documents outlining the need for change towards more resilient, just, and environmentally sustainable societies. For example, the international Sustainable Development Solutions Network’s (SDSN) Action Agenda for Sustainable Development (SDSN 2013) details ‘ten priority challenges of sustainable development’: ending poverty, development within planetary boundaries, effective learning for children and youth, gender equality and human rights, health and wellbeing, improving agricultural systems, curbing climate change, resilient cities, securing ecosystem services and biodiversity, and transforming governance. These are proposed as the basis of ‘Sustainable Development Goals’ (SDGs), which are currently being discussed prior to their elaboration and adoption internationally in 2015 to replace the Millennium Development Goals. So there is a growing consensus on the broad directions that need to be taken. The means by which such goals are to be addressed are often presented as: policy and monitoring, finance and incentives, legislation and regulation, information and campaigns. But these policy instruments are often only effective for as long as they are in operation ‒ because they are externally applied. Education however, can build lasting change - that is, sustainable change ‒when it is owned by the learner. Whilst policy instruments tend to treat symptoms of unsustainable activities and behaviours, education and learning can reach hearts and minds, and therefore address root causes. Further, many commentators over some years have been pointing to the urgency of a deeper cultural change, away from short-termism, individualism, excessive competition and materialism, towards an ethic of care, social justice, mutuality and wellbeing (see Earth Charter www.earthcharterinaction.org). Put alternatively, outer change depends on inner change as regards how we view ourselves and our relation with others and the wider world towards a relational consciousness, and this is essentially a learning process. Futurist Paul Raskin argues that, ‘The shape of the global future rests with the reflexivity of human consciousness – the capacity to think critically about why we think what we do – and then to think and act differently’ (Raskin 2008: 469). Hence the importance of the kinds of education that can effect this transformative process. The field of education for sustainable development (ESD) can be seen as a response to these considerable challenges. ESD is far more than teaching knowledge and principles related to sustainability. ESD, in its broadest sense, is education for social transformation with the goal of creating more sustainable societies. ESD touches every aspect of education including planning, policy development, programme implementation, finance, curricula, teaching, learning, assessment, administration. ESD aims to provide a coherent interaction between education, public awareness, and training with a view to creating a more sustainable future (UNESCO, 2012:33). This calls for a particular quality and orientation of educational and learning policies and practices, across all societies and contexts. UNESCO defines ESD as education which, ‘allows every human being to acquire the knowledge, skills, attitudes and values necessary to shape a sustainable future’ (UNESCO 2014) http://www.unesco.org/new/en/education/themes/leading-the-international-agenda/education-for-sustainable-development/. Yet this reflects the central paradox of ESD. On the one hand, it is seen as critical to any prospect of a more sustainable future, but on the other, it challenges mainstream thinking, policy and practice in much formal education. Sustainability issues are often characterised by ‘wicked problems’, complexity and uncertainty, requiring participative pedagogies and collaborative engagement, interdisciplinarity, real world research and engagement, and an open-ended and a provisional approach to knowledge. This is a different kind of education for a different age. However, universities – in particular – are based on silos with regard to their teaching, learning and research, and the more transformative and holistic approach that sustainability requires is often difficult to implement, requiring systemic change and organisational learning over time (as we have attempted at Plymouth University). Yet despite the real challenges involved ‒ and the lack of a supportive political climate in England ‒ there is a strong and growing movement towards the embedding of sustainability in education in schools and universities. This is often ‘bottom-up’, but increasingly there are signs that senior managers recognise that sustainability is important to an institution’s operation, curriculum and reputation, and the rich notion of whole institutional change towards the ‘sustainable university’ is beginning to take root (Sterling et al. 2013). Amongst university students, an NUS and Higher Education Academy study over three years shows that more than 80% of students surveyed believe sustainable development should be actively promoted and incorporated by UK universities ‒ a powerful incentive to universities hoping to increase student numbers (NUS HEA survey, Drayson et al. 2013). Further, the centrality of learning to developing effective leadership for sustainability is increasingly recognised in the business world (Courtice 2012). We are all ‘driving the future’, through our everyday actions and choices. If we are to secure a safer and enduring future for generations to come, the sustainability revolution ‘requires each person to act as a learning leader at some level, from family to community, from nation to world’ (Meadows et al. 2005:280). This is a big ask, but an inescapable one, and education needs to step up to the task. Assadourian, E and Prugh, T et al. (2013) Is Sustainability Still Possible? Worldwatch Institute, Island Press, Washington. Drayson, R, Bone, E, Agombar, J, and Kemp, S (2013) Student attitudes towards and skills for sustainable development, Higher Education Academy/NUS, York. Gore, A (2013) The Future, W.H. Allen, New York. Meadows, D, Meadows, D and Randers, J (2005) Limits to Growth: The 30-year Update, Earthscan, London. Raskin, P (2008) ‘World lines: A framework for exploring global pathways,’ Ecological Economics, 65, 461–70. In 1989, the biologist Mary Clark argued that in Western history there have only been two major periods of conscious social change and transformation where societies deliberately critiqued themselves and created new worldviews. The first occurred in the Greek city states (500 – 400 BC) where old ways of thinking became suspect and the first schools emerged. Philosophers purposefully asked different kinds of questions through public dialogues, new lines of thought and social action emerged, and a new status quo was established whose ideas and practices spread. The second time, Clark said, was through the Renaissance and the Enlightenment when Western culture, through its natural and social philosophers, subjected itself to critical thought and renewal. The result was the modern worldview that the West more or less retains today, and which many believe has resulted in the sustainability problems that affect us all. The irony is, of course, that the Enlightenment also brought new values and political and social freedoms that many live by, and would wish to defend. Clark (1989: 235) argued that we need to “collectively create a new worldview that curbs ecological and social exploitation, and recreates social meaning”. She saw that this process needed to be a society-wide, citizenly, phenomenon involving everyone – not just political, social, religious or cultural elites. It is clear that such processes need to be global in scale and scope, and optimists will want to find evidence of their happening in phenomena ranging from the UN-focused COP climate change discussions and the establishment of Sustainable Development Goals, to ground-up social action such as the Occupy, Anonymous, Divestment and Transition movements. All these, and more, might well be seen as unco-ordinated attempts to address the sustainability problematique: how can we all live well, without compromising the planet’s continuing ability to enable us all to live well, but just to write this down is to illustrate its inchoate state. Clark saw such transformational endeavours as educational in the widest sense, but she understood that the process could not just be trusted to formal educational institutions. She made a clear distinction between dominant processes of moulding society to fit in with the status quo and its received wisdoms, and the enabling of a critique of beliefs and assumptions which aids transformative change and the creation of new ways of thinking and being. Whilst it is the case that a transformative ideal has long been near the heart of some visions of education, particularly liberal ones, this has mostly been in the sense of personal growth and fulfilment. Even to consider that formal education as we know it could lead attempts to transform society and resolve the sustainability problematique, is to reveal a core paradox; that to change society, education and schools would themselves first need to be changed by that society. This is doubly problematic because two main purposes for schooling are conservative ones of values and cultural transmission, and a preparation for citizenly and economic participation in the society that exists; in this, education is necessarily seen in instrumental, not transformative, terms. Anyway, as some such as Andy Stables (2010) have argued, school students are only ever likely to pick up a general and diffuse sense of concern about and for the world’s problems, that is led or reinforced by any involvement they may have in the overall public discourse. Because of this, Stables says, curriculum should focus on the development of skills of critical thinking, dialogue and debate, with sustainability as one possible theme. Through this, young people would be enabled, should they choose, to take an increasing role in society and social change. The position of students in colleges and universities is similar, although their depths of understanding are greater, as is the influence they might bring to bear within those institutions, and in the jobs they take up. Indeed, if education, per se cannot do this, how could ESD be more successful? An artful response to this question is to advance a co-evolutionary argument: that successful ESD would lead to change in the demands made of education by society, which would then reinforce the need for more ESD, leading, eventually to a positive transformative cycle. Thus, the argument goes, with ESD working symbiotically within both the education system and within society more generally, those in power would soon come to understand the error of their ways. This view, however, relies too heavily on disingenuous appeals to false consciousness to be taken seriously. That said, the appeal of ESD is clear as it can claim to bring together forms of education whose geneses lie in learning activities that examine [i] how living things depend on each other and on the biosphere, [ii] why there is such a widespread lack of social justice and human fulfillment across the world and what might be done about this, and [iii] how everyone’s quality of life is increasingly imperiled by our current economic models. Thus the potential of ESD is that it might enable such deeply inter-related issues to be addressed together so that we might come to understand, address, and then resolve, the sustainability problematique. This, as we have seen, links the quality of people’s lives (now and in the future), the economic and political systems these are embedded in, and the continuing supply of goods and services from the biosphere that underpin and drive such systems. A potential strength of ESD is the variation that is found from one context to another which has arisen from local interpretations and developments as the concept is shaped to fit, more or less comfortably, with existing policy and practice. Inevitably, this all involves accommodations with preferred ideological and epistemological dispositions. Equally inevitably, all interpretations of ESD rest on understandings of what sustainable development itself is, even if the conceptual links are loose. This diversity within ESD, which is clear to see from emerging practice, is also a weakness as it rests on a lack of shared understandings which, in turn, inhibit communication and collaboration. In the two decades following this, policy proposals, curriculum and teacher development programmes, and innovative educational resources were all developed in largely unsuccessful attempts to nudge mainstream education practice towards the Tbilisi goals. Whilst there was some modest influence on curriculum and professional development, this was not ultimately significant and made little lasting impact on education systems. Looking back on all this in 1995, John Smyth argued that the adjective environmental had been a significant barrier, as it signalled that environmental education was something separate from established disciplines and practice, and was thereby outside mainstream educational activity and influence. The fact that environmental education tended to be promoted by ministries of the environment, rather than education, both reflected the problem, and further entrenched it. This reification is particularly pronounced in higher education where much emphasis has been placed on ‘introducing ESD’ (which hardly anyone had heard about) rather than further developing the considerable professional sustainability-focused activity and expertise that already exists. The result is that no one who really matters in education systems, takes ESD seriously, and, although UNESCO (2012:5) does say that "the need for ESD [has become] well established in national policy frameworks", the evidence for this is nugatory. The more liberal view of all this (Scott, 2014) is that educational institutions need to prioritise student learning over institutional, behaviour or social change, whilst making use of any such change to support and broaden that learning. In this sense, it is fine for a school, college or university to encourage its students to save energy, create less waste, promote biodiversity, work in the community, or get involved with initiatives such as fair trade, provided that these are developed with student learning and their actual studies in mind. To do otherwise is to forget why educational institutions exist. Being restorative of social or natural capital is laudable, but not if it neglects or negates the development of learning, and doing all this in collaboration with the communities within which institutions are socially, economically and environmentally embedded, will aid everyone's learning, and perhaps even sustainable development. Thus, a successful liberal education today will take sustainability seriously in everything it does. In particular, at its heart will be students asking critical questions of society, looking for the need for change, and getting involved. Whilst some will see this as ESD, for the majority it will just be education. Paradoxically, it may well be through such small-scale, on-the-ground, open-minded developments that the potential for the sort of transformation that Mary Clark called for, and the UN General Assembly says is so necessary, may well be enhanced. Stapp W et al. (1979) Towards [a] National Strategy for Environmental Education. In AB Sacks & CB Davis (Eds. ), Current Issues in EE and Environmental Studies (pp. 92–125). Columbus, OH: ERIC/SMEAC. UNESCO (2005) Promotion of a Global Partnership for the UN Decade of Education for Sustainable development: the International Implementation Scheme for the Decade in brief. Paris UNESCO. http://unesdoc.unesco.org/images/0014/001473/147361e.pdf. Schools are an important part of any community whose importance in promoting social health, skills and social capital should not be denied. Schools can lead by example by demonstrating ways of living, working and being that generate ecological literacy and practical competence. The UK's New Labour government aimed that all schools become models of sustainable development by 2020 with sustainable schools being 'guided by the principle of care: for oneself, care for each other (across cultures, distances and time) and care for the environment (far and near)' (DfES, 2006: 2). 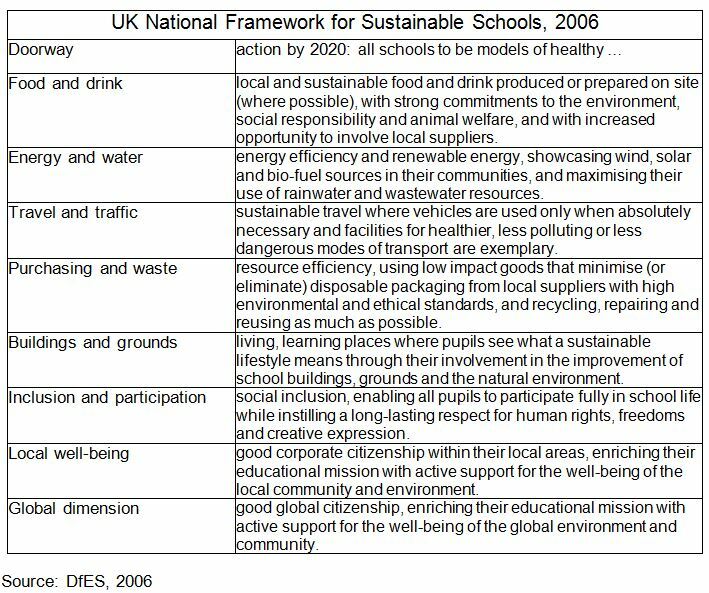 The UK's National Framework for Sustainable Schools asked schools to extend their commitment to sustainable development in eight key areas or 'doorways' incorporating the curriculum (teaching and learning), campus (ways of working, food, travel, energy, building construction and renovation) and community (promoting well being and public spirited behaviour). Initiatives like Sustainable Schools in the UK need substantial legislation to ensure any degree of serious success. This did not occur and the good intentions outlined here were abandoned as a result of the economic recession and the election of a Conservative–Liberal Democrat Coalition government in 2010. Department of Education and Skills (2006) Sustainable Schools: for pupils, communities and the environment, available at www.education.gov.uk/consultations/downloadableDocs/Consultation%20Paper%20Final.pdf. Education 4 Sustainability is a project coordinated by Nektarina in order to help embed sustainable development into the curriculum, and educate students about sustainable living, practices and futures. Education for Sustainability provides professional development in designing and implementing curriculum projects in Australian schools as part of a whole-school sustainability plan. Educating for Sustainability is Antioch University’s blog that explores the possibilities for sustainable education, green schools, and sustainable teaching, through discussion and resources. The blog of TES Australia (an online community of teachers) examines how sustainability can be effectively incorporated into the school curriculum from kindergarten onwards. The Earthwise Centre’s blog facilitates value-based education where relationships between people, and between people and the natural world, are central to social participation. The George Lucas educational foundation blog shares evidence and practitioner-based learning strategies that set out to empower teachers to improve school education. AASHE sets out to inspire and catalyze higher education to lead the global sustainability transformation through thought leadership, essential resources, and professional development. This is the blog of the King's College Sustainability team that aims to keep people informed about sustainability issues, events and opportunities at King's, and to inspire discussion and action. This CSRwire Talkback blog discusses pressing corporate social responsibility issues with a focus on education, green living, human rights, the environment and social enterprise.